click here to read this issue online. A short note to you...Let's Celebrate Christ! Who's Controlling Your Thoughts? Free Video! From Ameerah's Heart To Yours: Let's Celebrate Christ! So, what exactly are we celebrating in our special issue? Well, we have a lot to praise God for! First, it's The Hem's First Birthday! Praise God! And just look at what God has already done - Online just 1 year, and already 1,000 people a day are drawn to The Hem Bible Studies in search of God's promises. He's So Good! But, that's not all we have to Celebrate! As many of you know, God LOVES to call me out of my comfort zone. 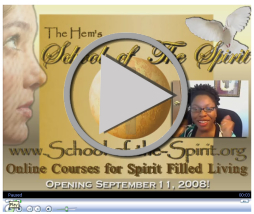 So, today you get to whitness Ameerah taking yet another leap of faith ...I'm officially announcing the Grand Opening of The Hem's School of the Spirit Christian Educational Community! Now, I've already been getting emails over the past few weeks from hungry Christians asking if they can sneak in early. The school will not officially open until September 11. I wish I could open earlier, but I still have a few more video courses that I want to get your opinions before we open. A Celebration of God's Promises and Provision! Spiritual Education * Inspiration * Fellowship * and FUN! ...let the Spirit renew your thoughts and attitudes. created to be like God—truly righteous and holy. Who's controlling your thoughts and emotions? Are you? Is God? One of the hardest things for any Christian to do is to bring their thoughts into submission to God. The Bible speaks promises of joy and peace. And yet most people in today's society, Christians included, struggle with depression and anxiety. Fear and doubt. But, how do you as a child of God gain victory over the battle for your mind? God has given you a way. Like all of your other needs, His provision for controlling your emotions and thoughts is laid out for you in His Word. Since this is a special Celebration Edition of The Hem Devotional, I don't just want to write to you. I want to do somehting special. I want to speak to you, directly to YOU, about God's promises to keep you in perfect peace... You can watch the free video-lesson that I made for you here. Praise God For 1 Full Year of Ministry!